Below find information about the various environments available for viewing at the Arboretum. The ecological communities are works in progress, representing years of intensive research, thoughtful land management strategies and untold hours of labor by Arboretum staff and volunteers. The Arboretum continues to work with these plant and animal communities to make them into reasonable facsimiles of the landscape types that existed in Wisconsin before European settlement. Until the mid-1800s, prairies and savannas covered most of southern Wisconsin. Today, thanks to many decades of intensive restoration work at the Arboretum, a succession of more than 300 species of native plants bloom on the property from April through October. Oak savannas are a species-rich ecological community characterized by frequent fire and open-grown trees. They once dominated the landscape of southern Wisconsin. 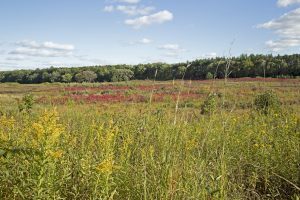 The world’s oldest restored prairie, Curtis Prairie occupies 60 acres just south of the Arboretum Visitor Center. Many classic experiments on planting techniques and the use of fire in prairie management took place here during the 1930s and 40s. In early fall, this deep-soil tallgrass prairie has colorful displays of big bluestem grass and Indian grass, towering from 7 to 8 feet tall. 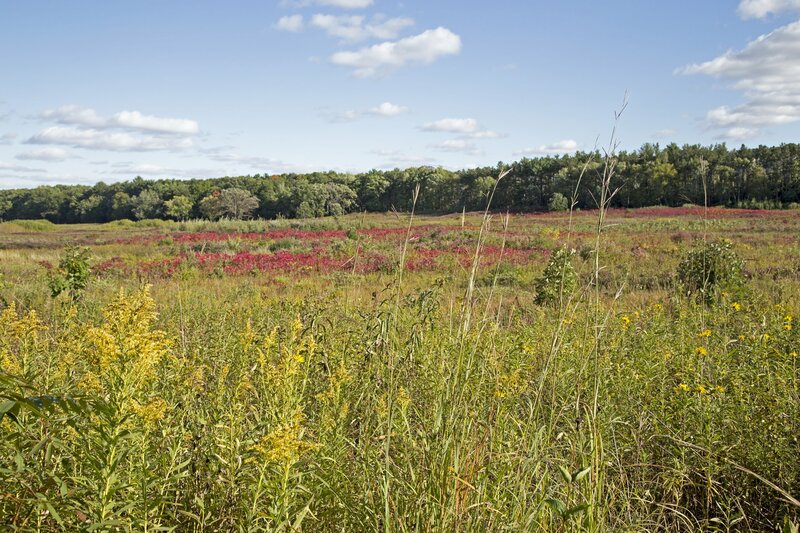 This 50-acre prairie restoration lies along the southern boundary of the Arboretum in the Grady Tract. Botanist and prairie expert Henry Greene planted it nearly single-handedly during the 1940s and 1950s. The prairie wildflowers are especially showy against the background of shorter prairie grasses, including little bluestem and prairie dropseed. Unfortunately, this prairie is threatened by unmanaged storm water runoff from offsite. Small in comparison to the Arboretum’s other prairies, this 4-acre prairie is just off Monroe Street, west of Lake Wingra. Its location along a busy thoroughfare affirms the value of using native plant communities to mitigate and beautify necessary urban infrastructures, such as the settling pond. This is a 5-acre, mesic to dry-mesic prairie that is dominated by Indiangrass. It is located immediately north of McCaffrey Drive, and just west of Wingra Woods. This prairie has relatively few weedy plants, but is quite patchy due to its origin as experimental plots. At this site, near the northwestern shore of Lake Wingra, there is a magnificent grove of open-grown bur oaks. The savanna grades into the Marion Dunn Prairie to the southwest. This savanna is being restored by replacing the understory of non-native trees, shrubs, and weeds with the grassland species likely to have grown in the original savannas. Restored on land that had been used for agriculture for many years, this savanna includes the Grady Dry Oak Woods, part of the complex of southern Wisconsin fire-adapted communities. Unlike the unnatural juxtaposition of forest surrounding most of Curtis Prairie, this newest savanna restoration project provides a smoother, more natural transition between Curtis Prairie and wetlands to the east. Woodland flowers bloom here in spring, followed by shady summer foliage and brilliant autumn color. Wingra Woods and Gallistel Woods contain ancient burial mounds, relics of a Native American culture that flourished here between 650-1200 years ago. With 41 acres of white oaks and black oaks, Noe Woods is typical of many woods that developed on former savanna sites after settlement put an end to the fires that had maintained the savannas. Most of the larger oaks are now about 150 years old, but the diversity of wildflowers has greatly diminished since the natural fires ceased. It is located near the southeastern entrance to the Arboretum. Encompassing 52 acres, this large block of oak woods on a hill south of Lake Wingra has been underplanted with sugar maple, basswood and beech — trees that can grow in the shade of the oaks. 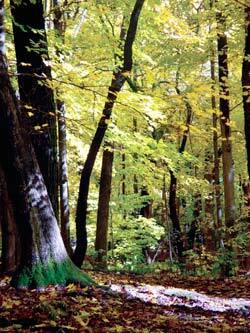 It is gradually changing to a shady forest with sugar maple as the dominant species. Foresters planted northern species here, such as hemlock and yellow birch, so that the area would resemble the sugar maple forests of northern Wisconsin. Just south of Wingra Woods, this 28-acre plot of oak woods on the southern slope of the hill will eventually be representative of the sugar maple forest of southern Wisconsin since it too was underplanted with sugar maple, basswood, and beech. This woodland is in the Grady Tract, the southern most portion of the Arboretum. Dry oak woods are considered a member of the complex of southern Wisconsin fire communities which also includes prairies and savannas. The Arboretum’s pine and boreal forests are representative of Wisconsin northwoods. Civilian Conservation Corps (CCC) crews planted most of the red and white pines in this 21-acre stand between 1933 and 1937, along with small numbers of red maple, white birch and some northern shrubs and ground layer plants of the northern Wisconsin pine forests. Experiments to establish northern shrubs and ground layer plants have met with limited success. By cutting selected trees, our ecologist hopes to create an “old-growth” structure in a relatively short time. This conifer forest is to the southeast of Curtis Prairie. A similar conifer forest, the Evjue Pines, is along the northern edge of the Grady Tract. These spruce and fir plantings on 14 acres east of Curtis Prairie and in the Grady Tract south of the Beltline highway were attempts to recreate a bit of far-northern Boreal forests. Part of the site of a failed residential development in the early 1900s, these mixed woodlands near the center of the Arboretum are now quite pleasant to hike or ski through. Species richness in shallow-water habitats at the Arboretum is diminishing due to a long history of modified water levels and aggressive plant invasions. Research on Arboretum wetlands focuses on how to restore biodiversity to these areas. This wetland is part of the site of a failed residential development in the early 1900s and once supported wild rice. It is now dominated by cattails, reed canary grass, exotic shrubs and other woody vegetation. It is located in the northwestern most portion of the Arboretum and is now being used for research. Encircled by woods, this pond and its associated wetlands is near the center of the Arboretum. Boardwalks lead visitors through the sedge meadow near Curtis Prairie. This is a good spot to see red-winged blackbirds and waterfowl among the cattails. As implied, this large wetland is located in the southeastern portion of the Arboretum.